The 24th Annual Illinois Family Business of the Year Awards recognize leading family businesses for their contributions to industry and community and for innovative business practices and strategies. 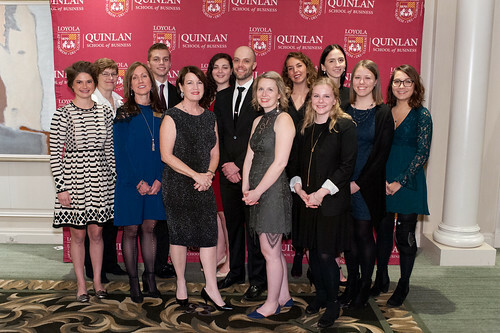 The Family Business Center at Loyola University Chicago’s Quinlan School of Business is pleased to announce the winners of its 24th Annual Illinois Family Business of the Year Awards. Presented in six categories, the awards recognize companies with exceptional commitment to family and family business. The center continues to recognize deserving family businesses and celebrate the family enterprise as it has for more than two decades. An awards gala honoring the winners and finalists, as well as the tradition, dedication, and success of the family enterprise, was held on Thursday, November 16, at 6:30 p.m. at the Four Seasons Hotel Chicago. View gala photos in the gallery below or on Quinlan’s Flickr page. This year’s sponsors include BMO Harris Bank, Katten Muchin Rosenman LLP, Wipfli LLP, MassMutual Hoopis Financial Group, MB Financial Bank, Oxford Financial Group, Perkins Coie LLP, U.S. Bank Private Wealth Management, Abbot Downing–Wells Fargo, Crain’s Chicago Business, and the Eli’s Cheesecake Company.